British family home with pizzazz! Creating totally bespoke homes that are both modern, new and yet have a heritage feel and nostalgic appeal is not an easy task, but one the design team at Roundhouse pounced on with a tenacity and fervour for their 'Ecclesgreig Gardens' project. We love that natural materials had a vital role to play and, as such, stone and slate have been used in volume to work alongside traditional elements, such as sash windows and space-giving dormers. Even the external garden walls have been given the rustic touch, having been created from chunky stonework blocks. The interiors are a light and airy delight, designed to contrast with the rugged materials of the exteriors to provide a warm, inviting and happy space that is family-friendly and aesthetically stunning. Roundhouse Architecture strived to create something very special; a series of houses that have the look and appeal of traditional family homes but with a modern twist and minimalist interiors. 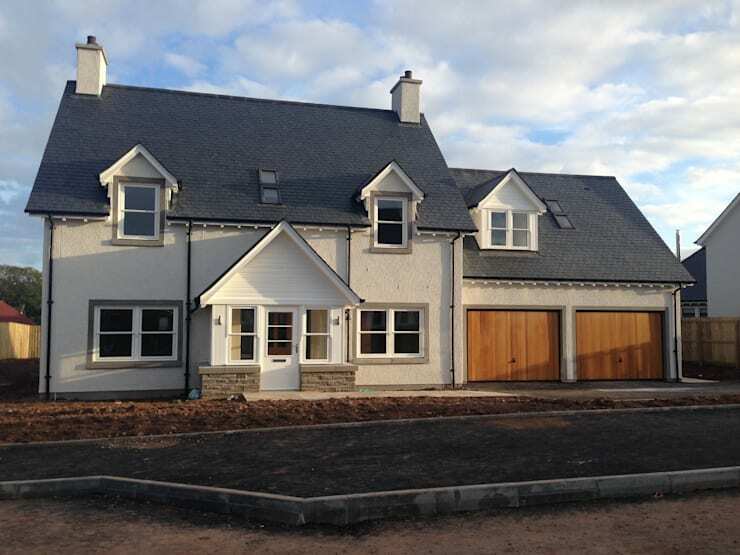 The result is some of the most beautiful new builds that we have seen, with carefully considered detailing and a finish so perfect that it's rarely seen in modern construction. Almost farmhouse in style, these magnificent homes look perfectly placed in their surroundings and seem to speak of elegant, comfortable living. We think they are simply lovely. As we move inside, it quickly becomes clear that these houses are destined for great things. The people fortunate enough to own one of them will no doubt feel the pressure to decorate in a stylish and elegant manner. We even think the houses seem to dictate a natural propensity for more minimalist themes. This kitchen, though unfinished, screams of potential and the monochrome colour scheme works tirelessly to make good use of the available space. 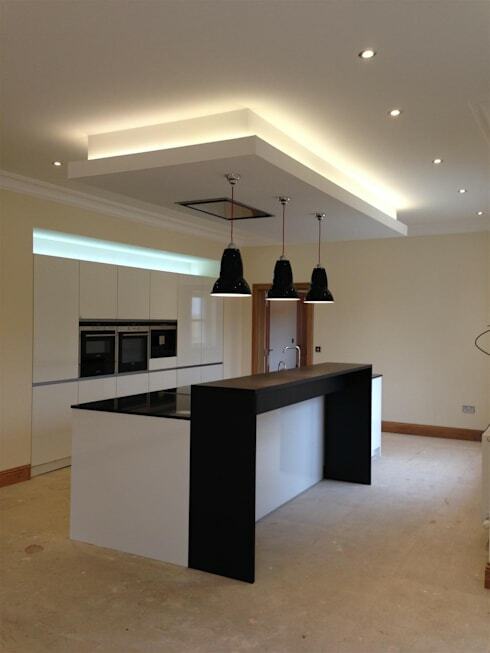 We love the integral breakfast bar and sleek black worktop, which gives the room real presence! They say the proof of the pudding is in the eating but when it comes to architecture and home design, the proof of a job well done is in the smallest details and tiniest rooms. 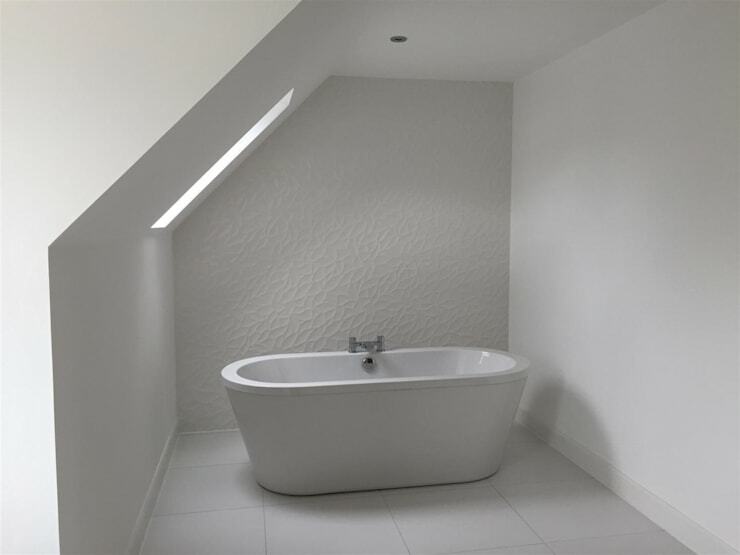 With that in mind, isn't this diminutive bathroom an absolute delight in white? Making perfect use of every inch of space, this bathroom contains everything you need, nothing you don't and hasn't muddied the waters with a loud colour scheme. In fact, the use of a textured feature wall is inspired as it allows for depth and playfulness that doesn't overshadow or shrink the room. In homes that seek to make the most of usable space, it can be a risky endeavour to include too much detail or colour. Therefore, we love there's a strictly neutral scheme in place, with white and natural wood leading the charge. While the white ensures everywhere remains bright and airy, the wood helps to add a little warmth and cosiness back in, which really works well with some fancy touches, such as the crystal light fixture. We could even imagine a large scale chandelier looking stunning in this spot. Nothing quite says high end like perfectly finished components and furnishings so these small dual sinks really make a point. Sitting on top of gorgeous dark wood cabinets, they offer individual convenience, extra bathroom storage space and a sharp, clean look. 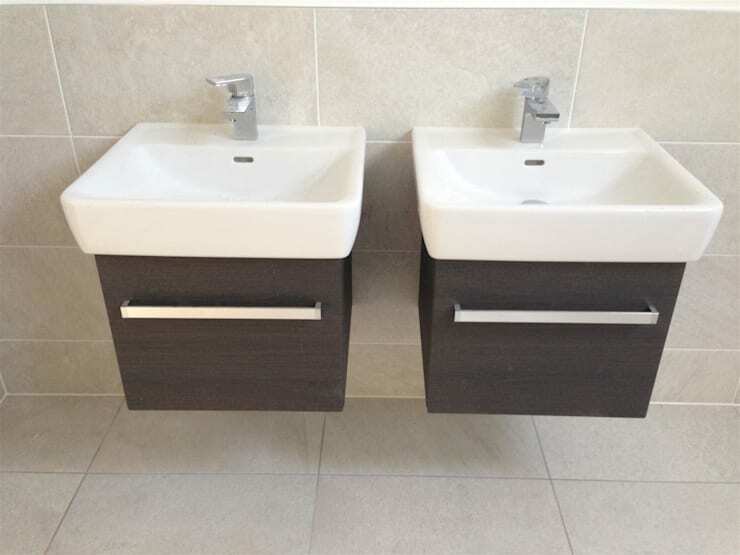 We think these would be an ideal addition to an en suite as you could be sure personal items wouldn't get mixed up or mislaid. We know that a perfectly rectangular mirror will also be present to highlight the home's recurring sharp lines and shapes. 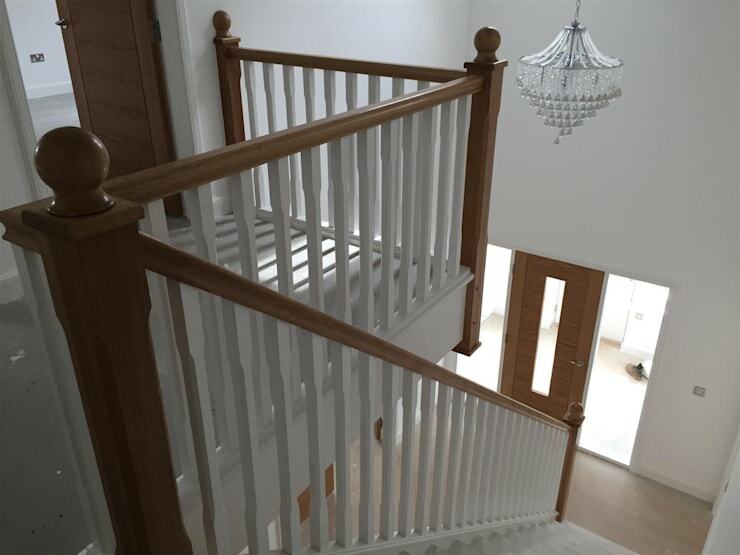 What sets these houses apart from other new builds is the attention to detail that has been maintained throughout every room. 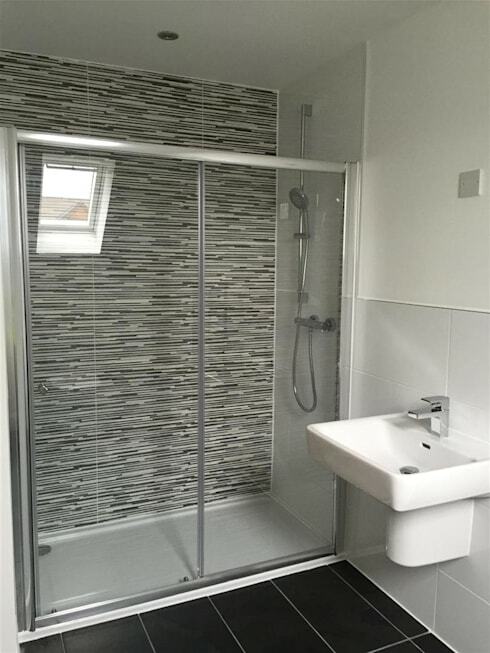 Take this shower room as an example. Other design teams may have simply left the whole room white but, having seen that there is enough space for some texture and a feature wall, this fabulous black and white design has been included. Now that's what we call detail orientated! For more beautiful new home inspiration, take a look at this Ideabook: Bloody Brilliant Yorkshire New Build.